Vinyl Table Covers, Vinyl Upholstery Fabrics | Americo Inc.
* 6100 Premium Collection Sale - 10% Off Premium Collection orders over $850, 5% Off Orders over $350! Americo Inc. has been manufacturing top-quality vinyl and laminated fabrics for table covers and upholstery projects at competitive prices for more than half a century. Whether your décor is contemporary or traditional, upscale or casual, Americo's easy-care table covers and coordinating upholstery vinyls can create the perfect ambience. We also offer the best terms in the industry with low or no minimums, free swatches, made-to-order table covers, and custom cuts from in-stock roll goods. More Styles. More choices. More colors. Choose your Vinyl Table Covers from the collection that best suits your needs. Our Value Vinyl Collection features custom made vinyl table covers in any shape, any size, with No Minumums! These vinyl table covers are a budget-friendly alternative to buying or renting table linens for special events. Value Vinyls are also available by the 25 yard roll or as cut yardage. Our Classic Vinyl Collection offers custom made table covers that are hard working and a great alternative to buying or renting table linens. This collection has a designer look without the upkeep. Classic Vinyls are also available by the piece or roll, and as placemats, table runners and overlays. Our Premium Vinyl Collection table covers are more durable, but still beautiful. These vinyl table covers last longer and are ideal for the most demanding enviroments. Some patterns in this line can be used for upholstery. Premium Vinyls are also available by the piece or roll, and as placemats, table runners and overlays. Our Designer Laminate Collection features woven fabrics that are a snap to maintain. Plus, laminates are suitable for upholstery projects. 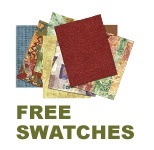 Designer Laminates are also available by the piece or roll, and as table runners and overlays. We can also laminate your fabric or material with our Americlear Lamination process. All of our Vinyl Upholstery Fabrics and Table Top Padding materials are offered by the roll or in custom cut pieces. You can make vinyl table covers the exact size and shape you need, and save yourself a fortune. All our Vinyl Fabrics are available as 25 yard rolls, custom cut pieces or cut yardage. A single 25-yard roll yields 17, 52" x 52" table covers. Choose from our Value, Classic, Premium, or Designer collections. Our Distinctions Collection of upholserty vinyls are perfect chairs, booths, barstools, cushions, and sofas in all types of commercial settings. Upholserty Vinyls are available by the 25 yard roll or as cut yardage. Our Non_Slip Table Padding cushions table tops providing increased comfort and safety for your guests. Classic Vinyls are also available by the piece or 25 yard roll. Rolls come in 3 widths: 36", 48" and 72". Our Classic Vinyl White Table Padding cushions table tops providing a luxurious feel and appearance. Vinyl Padding is ideal under woven table linens. Give vinyl or linen table cloths a soft underlayment and slip resistance with our 9808 vinyl. This heavy-duty vinyl can be custom cut to any length or purchased by the piece or 25 yard roll. Rolls come in 3 widths: 36", 48" and 72". Our Photo Galleries are filled with design ideas for every decorating style and taste.